Parsley is an herb grown almost year-round in North Carolina and is a popular spice for garnishes, soups, salads, meats, and more. The leaves tend to grow between 5 and 12 inches long. They are leafy and green. The two main types are Leaf Parsley and Italian Parsley—with leaf parsley being far curlier than Italian parsley. For longer life, snip the ends of the parsley bunch and store in a jar with water. Or simply cover the bunch with a bag and store in the refrigerator. Parsley is a fresh herb that can be eaten raw atop any dish or cooked with dishes by steaming or stir-frying with ingredients. Parsley is a great addition to any dips, salads, or spicing fish and meat. Select only parsley that is bright green, unwilted, and fresh looking. Avoid damage or discoloration as this signals old or past-due herbs. Parsley tends to grow almost year-round in temperate climates. It is most often available during the spring and fall. Parsley grows in bunches from ground level. If the entire bunch is cut, the plant won’t grow back. 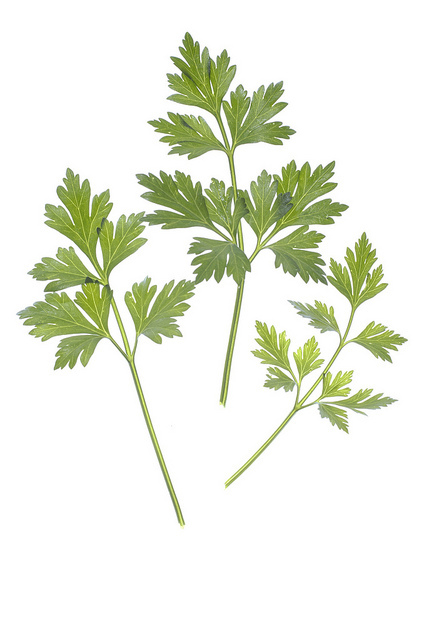 If stems are selectively cut, the plants will continue to generate more parsley stems. Parsley-Infused Salsa—Chop peppers, tomatoes, onions, and herbs—parsley and cilantro. Dice ingredients with lemon juice and olive oil. Spice with salt, pepper, and oregano. Great for dipping! Tabbouleh – Chop tomatoes, green onions, cucumbers, and herbs – parsley and mint. Combine with ½ cup cooked bulghur, or quinoa for a gluten-free version, as well as lemon juice and olive oil to taste. Season with salt and pepper.